The port of Urunga was closed to trading vessels in 1935, the Pilot Station ceased operation in 1936 and an exciting and often dangerous chapter of Australian history came to an end. There are glimpses of this remarkable heritage to be seen today. The break walls, the footbridge (now extended out to the beach) and the remains of the wharves set the scene. The Pilot House has recently been restored and given local heritage status to preserve the building and its setting and the signal flagstaff has been refurbished and replaced in its original position on Flagstaff Hill. The Pilot House and the signal mast are heritage icons and if you stand near them on the hill, with their vistas out to the bar and the sea beyond, it is easy to imagine the estuary below you crowded with ships, with the Pilot and his boatmen hard at work. Courage, endurance and resilience created Urunga and its rich cultural legacy will long be remembered. 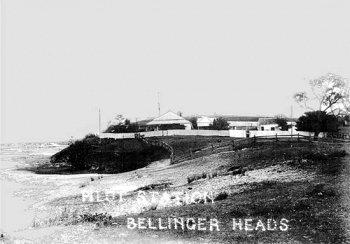 Two Expeditions to the Bellinger, 1841 and 1842: an extract from Clement Hodgkinson’s book, Australia from Port Macquarie to Moreton Bay, first published in 1845. Crossing the Bar: a history of the Urunga Pilot Station. With Luck and a Fair Wind: Bellinger shipping 1843 to 1933 in photographs.